The Simply Measured Blog released some findings that point to a change in Facebook’s News Feed algorithm. 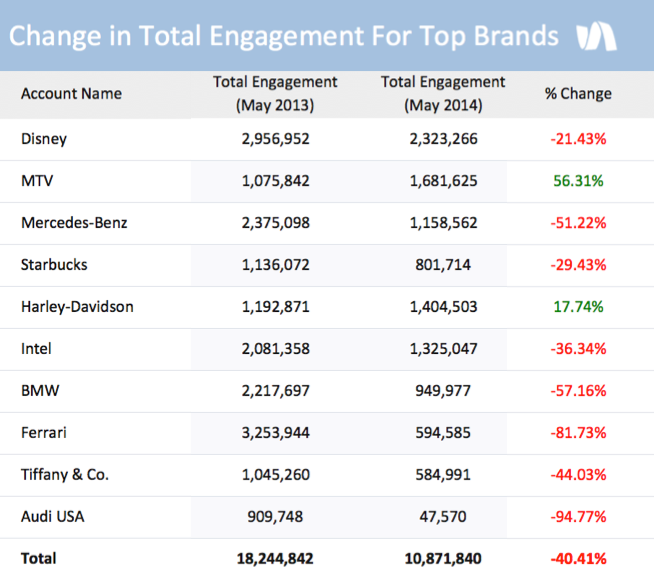 Simply Measured decided to look at the top 10 brands on the network, and how these changes have impacted overall engagement. With a collective audience of almost 358 Million, these ten brands represent a significant portion of Facebook’s buying power, and their increased efforts (indicated by a growing number of brand posts from the group of 10 accounts) aren’t producing results. Engagement seems to be steadily declining, which is a scarier proposition for brand marketers than the organic reach decline alone. We compared the engagement for these ten brands year-over-year, looking at May 2013, which was included in our first Facebook Network Study, and May 2014, which ended this weekend. This aggressive drop in actual engagement showcases exactly why the organic reach crisis should be a focal point for large brands. Facebook is pushing brands to focus on their strategy; both with stronger content, and with an increase in ad spend. With engagement plummeting along with reach, it might be time to pony up.